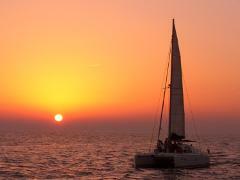 Enjoy a top-notch Greek experience in Santorini on board a deluxe catamaran. Stop at the volcanic hot springs and the red and white sand beaches as you enjoy swimming and snorkeling before sailing to the south, towards the beaches. You will also get a taste of a fresh cooked Greek meal on board. The route of the small group 5-hour sailing tour will take you around the Caldera Cliffs with various destinations along the way. As you cruise along, enjoy unlimited Greek wine, beer or soft drinks. You will also get the chance to see the beautiful Santorini sunset before your tour comes to and end and we transport you back to your hotel on a private minibus. "the view was amazing, i took too much photos there. also a good price"
"I really enjoy the view of Santorini from the Cruise regardless that the tour was late by 15 minutes and the meal was really delicious and my family agreed with me on this too."